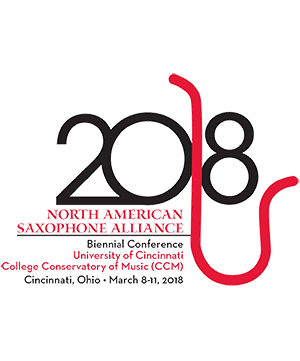 The NASA 2018 Biennial Conference will be held March 8-11, 2018 in beautiful Cincinnati, Ohio, home of our host University of Cincinnati College - Conservatory of Music. The event will take place from March 8-11, 2018. We anticipate saxophonists, exhibitors, collaborative musicians, family members, and guests from around the world to attend the concerts, seminars, workshops, lectures, panel discussions, masterclasses, exhibits, and ensembles. In addition, NASA will be holding solo, jazz, quartet, and high school solo performance competitions. As a non-profit organization that puts its revenues back to work for its membership, we rely on NASA members to help make the conference a great experience for everyone who attends. We are grateful for the many presenters over the years who have donated their time, travel, and talent as a way of giving back to the saxophone community. The following is a tentative list of conference presenters, subject to change. Click on a Presentation Title to see more information about the presenter and their presentation. 12:00 PM 500 Person Super Ensemble! Everyone Bring Your Horn!